This inverter runs�0-4 feet of EL Wire on�Two AAA battery. 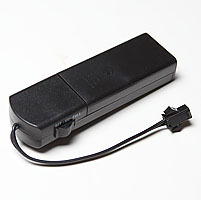 Add 2 AAA battery to this battery pack inverter and attach your EL Wire. 20 hour run time on alkaline batteries in solid on mode with 0-4 feet of EL Wire.